My new album Grail Songs is now available here as a CD and a download. There are 12 original new tracks, with the total running time a super 77 minutes… almost 2 album’s worth! Guesting, are 2 Hungarians: female backing vocalist Yloush (Székely Ilus), and Géza Kremnitzky of the folk-duo Hungarikum Együttes, who provides extra guitar and mandolin. I’m now based predominantly in Budapest, and the whole album was inspired by, composed, recorded and pressed in Hungary! The artwork for the beautiful CD digi-pack was also graphically designed by 2 Hungarians, Szabolcs Dávid, and Christian artist András Simon. The songs are spiritually-themed expressions of love, loss, sacrifice, magic and mystery on the path of higher truth. Katinka and I have begun to evolve a mini-CD project that was her inspiration… to record some duets around the theme of the word ‘Hallelujah’ in the title! I have a new song called ‘Hallelujah prayer’; there is Leonard Cohen’s iconic ‘Hallelujah’, and there is the Pachelbel Canon which I’ve set to a Hallelujah chorus in the past. That’s for starters! We have already made a YouTube for the song ‘Dance with me’ from my album Grail Songs, which is almost like a Renaissance ballad of courtly love where Truth sings to Love! Katinka has made several films, including appearing with Brad Pitt in a zombie film, and recently with Kiera Knightly. Her best known film in Hungary is where she plays the feisty gypsy girl Böske in Megy a Gõzös (The Train Keeps a-Rollin’). The word ‘Hallelujah’ means God is present. 30/10/18 ~ Book of lyrics in English & Hungarian, with CD’s, photos, biography and artwork! If I can get the funding I would dearly love to present a book of my lyrics (in both English and Hungarian, because those are the places I commute between), that contains a CD of selected tracks, and also a CD of the spoken word in Hungarian, set to gentle background music. This would be a large hard-back book, and would also have photos, graphic art-work and biographical details. Maybe it’s a kind of life’s-work project! Volume one, at least! I’ve been producing songs for 31 years now, and have over 300! Many songs have already been translated by Yloush, but if she’s unable to complete it with me, I have other possible translators. So a lot has already been done, but I would need more funding to complete it! 30/10/18 ~ Five other albums currently in the making!!!!! My various projects tend to be rivers that can change their course, but they all still lead to the sea! I had almost finished an album of duets with my friend, colleague and female backing vocalist Yloush (Székely Ilus), called God Gave us Flowers… where we sang some cracking cover versions… buy Yloush needed to shift the focus more to her own things, and so it will no longer be an Asha & Yloush album, but a solo album with her singing backing vocals on some tracks. We were also embarked on making an album of songs in Hungarian (her native tongue, and Hungary is now where I’m predominantly based), called Songs of Truth & Grace, but I’m not quite sure what will happen there now. Maybe we can resurrect it a bit later, or maybe other Hungarian singers can contribute. We have five songs already recorded. My plan was to do the musical arrangements and play the music, but to support the Hungarian singing rather than take the lead as it’s not my native tongue. Some of the songs are traditional Hungarian folk songs, and some are my own songs translated into Hungarian. And as it’s turning out, I’m collecting piano versions of some of my latest songs, and also instrumental versions… plus new piano and instrumental compositions… so I hope to have both a new solo piano album, and a new solo instrumental album released in 2019. These both are very exciting projects for me. It’s so tempting to write lyrics for everything I compose, but sometimes the music alone is enough, and I have to practice restraint. I don’t have titles yet for these two projects. And finally I’m already five songs into a new solo studio album called “Sirius”, which will probably be finished by next spring! 15/01/18 ~ New album out now "Knights & Angels"
My new album Knights & Angels is now available here as a CD and download. There are 12 original new tracks, plus a thirteenth song written with Oliver Riz. Guesting musicians are Hungarian singer Székely Ilus (Yloush) who sings and arranges the female backing vocals, and Géza Kremnitzky of the Hungarian folk duo Hungarikum Együttes who plays acoustic guitar, mandolin, Irish bouzouki and harmonica. The album was composed, recorded and filmed for YouTube in Hungary, where I now live most of the time. The CD is in a beautiful digi-pack format designed by my son Isaac, with a 12-page booklet, and the playing time is a healthy 72 minutes, recorded at Origo Studio in Budapest! The songs are spiritually-themed expressions of love, loss, sacrifice, magic and mystery on the path of higher truth. * Grail songs ~ my follow-up to Knights & Angels as a solo album. Eight songs have already been composed, and four recorded. Possibly ready by mid-summer 2018. * God Gave Us Flowers ~ this is an album of cover versions, where I duet with friend and colleague Székely Ilus (Yloush). Five songs have already been recorded, of which four are already on YouTube. These include versions of R. Kelly’s soulful ballad ‘If I could turn back the hands of time,’ and Pachelbel’s Kanon set to a Hallelujah chorus and a song of peace. Also possibly ready by mid-summer 2018. * Songs of Truth & Grace ~ this is principally my piano and Yloush’s voice; gentle; meditative and pure. Possibly ready by the autumn 2018. * The Mother, the Lover, the Healer & the Muse ~ this is a different album of covers with just me singing. Possibly ready by Christmas 2018. I always have new music and YouTube projects on the go, and am currently very fortunate to have a fabulous set-up here in Budapest, with a reliable studio to record at which is just about affordable, friends who are gifted musicians guesting on my songs, and a marvellous city and nearby country-side in which to film YouTubes for my songs, with many sacred sites. So all of the above projects are subject to change, and could appear earlier or a little later than indicated, and all could be joined at any minute by new projects! There is now a page on my site with some poems I have written, several of which have been set to music and imagery on YouTube. And my musical friend and neighbour Yloush also translates some of my songs into Hungarian (as I live there!) Several of these translated songs also appear on YouTube, but it’s a long project… I have over 300 songs and rising. This may be completed by 2060, by which time I will be over 100! I take my cue from the pianist Arthur Rubinstein who, reputedly, on being given a new 15-year contract to record by Sony when he was 90, complained that it was not long enough. Eventually, I would like to publish a book (or books) with my lyrics, and volumes of poetry... both in English and Hungarian… when I can afford it! You may notice that I have a ‘Kindness button’ here (top right on the home page, with a ‘K’ in a heart as an icon). Any contributions you may ever feel inspired to offer, help enormously to manifest the songs and films you see here. The big costs I have are for the studio time, and the pressing of the discs, and the smaller costs are for travel, accommodation, artwork, website updates and maintenance, and insurances. From start to finish a new album might cost about £5000 to get it from my heart to the market-place, but my main motives are to create music for love, art, truth and spirit, not to get rich! I have a basic infra-structure so my CD’s and downloads sell (here on my site, and through distribution, and sites like i-tunes, amazon, spotify and so on), but it only just about covers the costs or… more often... falls a little short. This is the way of the artist! I am an amateur in the truest sense… from the words ‘ama te’… to do something for higher love, but my products are very professionally produced. To provide for my family I earn income from being a transpersonal psychotherapist. The music has to pay for itself! And yet somehow I’ve managed to create over 30 albums in 30 years, and to make over 333 films (lots of ‘3’s’!!) Occasionally benefactors help out, and this has been a great blessing. So if you are touched by my songs and feel so inspired, then all contributions to costs are gratefully received! And you will be loved not only by me, but also loved in heaven! You know it makes sense! ~ Knowest thou not whom I am? 06/03/17 ~ NEW ALBUM OUT NOW “CALVARY HILL”!!! My new album Calvary Hill is now available! There are 12 new, original tracks on it, and over 73 minutes of music in a beautiful digi-pack format, with artwork designed by my younger son, Isaac. Guesting on it is Géza Kremnitzky of the celebrated folk duo Hungarikum Együttes, who plays his wonderful medieval brand of mandolin and classical guitar. The songs are spiritually-themed, and inspired by love, loss, magic and mystery. The ‘Calvary hill’ in question is just outside Budapest, where I have been living. 06/03/17 ~ NEW RECORDING “KNIGHTS & ANGELS” NOW UNDER WAY!!! I have already begun work on my follow-up to Calvary Hill, and am recording new compositions now in Budapest. This album will be called Knights & Angels. The first track is now recorded; ‘Just slip away’. 06/03/17 ~ NEW ALBUM OF COVER VERSIONS NOW UNDER WAY!!! I have also begun to record a new volume of cover versions, to go with Songs of Love and Chains (2008), and Sun, Sorrow, Flowers, Moon (2014). The first track ‘To know her is to love her’ is now recorded. 06/03/17 ~ COLLABORATION UNDER WAY WITH OLIVER RIZ!!! I have written and sung the lyrics to a piano piece by Oliver Riz, and I’ve called it ‘Take this love’. We are recording it in Budapest, and will go out very soon under the wing of Anamé Music. The Anamé Programme is a healing, meditation and musical foundation in Budapest. There will be a YouTube, too. 06/03/17 ~ POEMS & LYRICS; BOOKS UNDER WAY!!! I intend to publish my first volume of poems, and also a book of song lyrics, perhaps with some photos and biographical detail. I have the momentum and opportunity to print these now in Hungary (in English). I’m not sure of the timing, exactly, but I would hope both might be ready within 18 months. 31/08/16 ~ RECORDING NEW SONGS!!! These songs are inspired by where I live at the edge of Budapest half the time, up in the Buda hills in the village of Hidegkút. Opposite my bedroom window is the magical, mystical Calvary Hill (Kálvária-hegy). The mountain speaks to me! My friend Brigi lives down the road, and she's on fire with her sacred art at the moment... and these paintings also speak to me. We both of us go into the forest (at different times!!!) and receive inspiration through the ether. It is a very powerful, ancient territory. This album should be finished in December (artwork & everything) and might even be ready for Christmas. The music is quite folky, anthemic, intimate and poignant. 'Sweet wood-smoke' is about a lost love, but I can see her house from the hill... and all our friend's houses... and my little life up there... and I wonder if we can smell the same sweet wood-smoke. 'Calvary hill,' the title track, is like an ancient Grail ballad... a chivalric song about love and sacrifice, and crossing over into a spiritual dimension, shamanically. 'Never give up' spurs me on... I needed to write that to stop me giving up! I find the spiritual path THAT hard! Love, loss, sacrifice, the endless road... full of ordeals, dragons and inner demons. My path is to give my whole heart to God, unconditionally...to give my whole life. I got very ill this summer with grief and loss, and bewilderment... I lost 8 kilos, too. The path of glory or the path of sorrow... they keep changing the sign-posts! 'Who are you?' is about my feelings for a lost love, and a beautiful truth in her mystery that I treasure. She must fly... and I must believe. Brigi painted the magnificent 'Cross of Lancelot'... about the moment Lancelot sacrificed his love for Guinevere to return to the Grail. This painting is almost too painfully beautiful to look at, for me. It also informed the song 'Calvary hill'. And Brigi's 'Noli Me Tangere' inspired my anthemic song 'Jesus come to me'. In the painting Mary Magdalen drops her vase in awe when she first sees the resurrected Christ. The painting is flooded with light. I feel swept up in a current of spiritual beauty, and these songs are flowing. Tim's studio is a shed in the rural, windswept garden next to the chickens! On sunday, as I was recording 'Never give up', a violent, billowing storm rolled in. Hail lashed the roof, lightning hit the weather vane and all the lights went out... including the computer. OK, OK I thought... I hear you! Never give up! 27/07/16 ~ NEW ALBUM “THUNDERHEART” READY!! 13 NEW TRACKS & OVER 73 MINUTES OF MUSIC ON DOWNLOAD & CD!! Asha’s new studio album “Thunderheart” is now available here on CD and as a download! Over 73 minutes long, there are 13 new tracks; 10 original compositions, plus the traditional songs ‘Michael row the boat ashore’ & ‘In the bleak midwinter’, as well a cover version of ‘You’ll never walk alone.’ For the latter, and for ‘Michael row the boat ashore’ Asha has added additional lyrics. The overall feeling is joyful and uplifting, with powerful hand-­drum driven spiritually-­themed songs alternating with very delicate, devotional, mystical ballads. See the Shop for CD purchase, and Downloads for downloading the album or individual tracks. 27/07/16 ~ CD BARGAIN OFFER!! “State of Grace,” “Sacred Songs,” & “Sun, Sorrow, Flowers, Moon” are currently available for £12 all together; £9 for any two, or £5 for any one. Offer until September 30th! 27/07/16 ~ ASHA/ASHER... NAME CLARIFICATION!!! Asher Quinn was also known as ‘Asha’ earlier in his music career, and has now returned to that name on albums and YouTubes! So the artist formerly known as Asher Quinn, who was formerly known as Asha, is now Asha again (use Prince for reference)! 27/07/16 ~ A FURTHER ALBUM IS ALREADY UNDER WAY ~ "CALVARY HILL"
Recording has already begun on a new album after “Thunderheart,” due for completion around November in all probability. This will be called “Calvary Hill,” and will feature several new compositions, plus at least 3 Hungarian folk­songs sung in Hungarian! Asha now has a home just outside Budapest where he lives half the time, alternating between there and London. Opposite his Budapest home is Calvary Hill, source of much inspiration! The feeling of the new compositions and traditional songs is more folk-oriented... intimate, spiritual, visionary and gentle. ~ Do you love me still? 18/09/15 ~ New album THE BLESSING & THE BLISS now available!! A new album of mine The Blessing & the Bliss is now available! There are thirteen original tracks, and seventy minutes of music here. The songs are spiritually themed, and are the first set of new, original songs I’ve composed since February, 2013, reflecting an intense and vibrant spiritual journey during this time. The project began in February 2015 at Kerani Music in the Netherlands, but was halted in late March, due to the Dutch production team withdrawing for various reasons. The cavalry arrived in the form of Tim Rock, and his studio in Norfolk, England, and I completed the songs there between June-August. My youngest son Isaac, 17, stepped in to do the artwork. After an ‘altered’ episode in March, spiritual poems began to occur to me. Nine have come so far. The first two of these Dive deep and The living waters have now been made into YouTubes, edited by Maggie Arrowsmith up in Scotland, from my scripts. I have a Kindness Button on this home page (top right), and several people who resonate with my songs and films have been kind enough to offer contributions, to help me to continue to share the fruits of my inspiration! As a business, my enterprise manages to break even… when my accountant sees the positives! I compose and envision, and then there are several costs involved… recording, artwork, CD pressing, website maintenance and update, travel, promotion, insurances, licence fees and so on. I don’t have my own studio or recording equipment… I’m the visionary one, but not the technical one!! I sell CD’s & downloads here on my site, and my titles are available through all the usual suspects… Amazon, I-tunes, Spotify, CDBaby, Soundcloud, Bandcamp and so on, plus they are distributed by New World Music & MGMusic in the UK, Oreade in the Netherlands, Silenzio in German-speaking countries and Niche Records in Romania. All these great companies need to take their cut, of course! And I give concerts where I’m invited. I have no manager or agent… I’ve never found one who understands what I do exactly, by creating and sharing spiritual music! Since 1987, I have made 23 studio albums and sold over a million CD’s, world-wide, and I’ve sung in the UK, Belgium, the Netherlands, Germany, Hungary, Iceland, Denmark & Finland. I’ve filmed in the England, Scotland, Ireland, France, Slovenia, Turkey, the Netherlands, Germany and Hungary. I started out signed to New World Music, and received a small, guaranteed royalty for sales, in common with many artists. In 2007 I went independent. With the global decline in the CD market and the rise of streaming, life has got harder in the business sense for all independent artists, and income has dwindled even though ‘plays’ have risen enormously. So some people have been wise enough to see this, and kind enough to offer support by making contributions. My gathering feeling is to soon make my art available for free… after all, it is given by God… and I am taking steps to implement this. Already my YouTubes offer freely available access to my songs and films, and people can listen all day for free, if they wish, on Spotify and Soundcloud. So if anyone feels inspired to support this enterprise and help with the costs, your generosity would be much appreciated. The world is changing… spiritual forces are emerging. The integrity of what I do is simple and spiritual… it is not really a business or an industry, it is intuitive art; spiritual communication. It doesn’t feel quite right to me, somehow, to make commerce out of this art. But the logic of the economic world means I have to step very carefully… if I make everything freely available without careful planning, I am also liable to pay more tax! So these changes are in evolutionary process! Unfortunately, three projects I’ve been working on at Kerani Music in the Netherlands have had to be shelved, because the producer there has fallen ill with stress-related symptoms. He needs time to recover, and we’ve mutually agreed to part company. I was working on a new album (with a former working title of “Raw & Reflective”) called “The Blessing and the Bliss”. Nine songs out of thirteen were almost complete. I’m not clear yet how to rescue this project, but if I do, details will emerge here and in any newsletters. We were also working on a concert DVD, and this, too, needs to be rescued, if poss… but I’m not sure how, quite, at the moment. It’s all a delicate eco-balance with time, finance and availability… I have no problem with inspiration, flow and energy!!! My music income has been hit by this turn of events, meaning I don’t know how to finance any rescue package just now, let alone find a studio to complete them that has compatible software. Also, three concerts set up for June in Holland have had to be cancelled. I have a KINDNESS BUTTON on this home page (top right!!!) If you could see your way clear to providing about £2500 I’d be most grateful! I’m still making YouTubes to older songs, however, and am now writing spiritually-themed poetry, which I post on Facebook! Please bear with me, music-lovers!! I’m working at Kerani Music in the Netherlands to produce a DVD of 16 tracks, from a concert I gave in Limburg in May, 2014. It’ll be just the DVD… no CD! Arno, my producer, and I are working on eight tracks, and Maggie up in Scotland (who edits my YouTubes) is working on the other eight with us. We’re interspersing close-up and mid range concert footages, with some beautiful images from my YouTubes and nature libraries. They look lovely, and it’ll be just like having a bespoke concert in your front room! "Listening to these pieces is deeply meditative... it's like watching a fire or gazing at the ocean; they're always changing & endlessly fascinating, and yet you are held in the magical spell of the musical element... in the captivating narrative." 16/10/14 ~ FORTHCOMING CONCERTS; NETHERLANDS & LONDON!! 16/10/14 ~ NEW PIANO ALBUM IN PRODUCTION: PIANO RHAPSODIES! I intend to be completing the production of a new improvised piano album, at the end of October, in the Netherlands. If all goes well, it should be available in December or January. It has already been recorded... several spontaneous pieces with a passionate Hungarian flavour! I don't have a title yet, but my working title is Piano Rhapsodies. It's my first entirely instrumental creation since 1993! This CD/DVD of my 2014 May concert in the Netherlands will now appear in the new year, after my piano album comes out. Probably early spring. I have written 6 out of maybe 12 songs for a new studio album of spiritual love songs, the working title of which is Being of Light. Production is planned for the spring of 2015. It will be my first studio album of new songs since State of Grace in 2013. I have now completed recording my new album of cover versions at Kerani Music, in the Netherlands and it will be mixed and mastered in early September, ready for pressing. I'm hoping it will be available to hear and buy in October. Arno op Den Camp produces, and does alchemical computer wizardry to bring it all together, digitally, and Erika Kele (Kerani) sings incredibly moving, ethereal backing vocals. I play the instruments, mainly keyboards (& the occasional mouth organs), and intuit the arrangements, and Arno & I share the percussion. Arno & Erika chip in regularly with invaluable extra arrangement suggestions, and Ollie the Chihuaha does high-pitch baying to the moon when he hears the high piano notes! The church bells just outside the studio seem to peal in harmony with the songs! 02/08/14 ~ Concert CD/DVD news! This will definitely go ahead, and be available to see, hear and buy around Christmas-time, I hope! There is some great footage from my recent May concert in a magical setting in Beek, Netherlands, and we shall compile it with some other film goodies to make a lovely CD/DVD. In the autumn I plan to begin work on a new collection of my own spiritual compositions, which has a working title of Being of Light. Songs composed so far are: The Lightning Seed, Spiritual Love, Finding God with You and 'Be'. There will probably be 12 songs in all. I always have it in mind to compose another piano album, and this will definitely happen... but I can't quite say when, yet! It's to do with time and money! My working title for it is White Temple! Sometime quite soon I intend to start work on two new albums! The first will be Songs of Love and Chains volume 3... probably 17 or 18 songs I cover by other artists, re-interpreting them spiritually in delivery and ambience. I did this with a double album in 2008, Songs of Love and Chains volumes 1 & 2, and people really seemed to resonate with it. I made it sound like I sang in a cathedral! Now I'd like to add another collection. These are songs I cherished and loved growing up, and which touched my heart... 'Scarborough fair', Dylan's 'Don't think twice', Leonard Cohen's 'Bird on the wire', 'What a wonderful world', Donovan's 'Colours', Sting's 'Fields of gold', 'In the bleak mid-winter', Bob Marley's 'Stir it up', Georges Moustaki's 'Natalia' and many more. I'd hope it might be finished mid-autumn. Then, probably in 2015, I have a new set of higher love songs I'm writing which I'd like to record. I have already written 'The lightning seed', 'Spiritual love', and 'Finding God with you'. The first two I recently sang live in concert in Holland. I know I keep saying I would like to record a piano album, called White Temple... and I do really want to do this! I just need to find enough hours in the day and enough funding to keep composing, recording, making YouTubes and giving concerts! I also have in mind an album of channeled spiritual communion, but I'm eager to go with the first two, for now! There's a new gallery of mostly recent concert photos just added under 'Galleries' ! 27/04/14 ~ THREE CONCERTS COMING UP IN MAY, IN THE NETHERLANDS! Asher will sing in Hellevoetsluis, near Rotterdam on May 16th; Strijen, near Dordrecht on May 17th and Beek, near Maastricht, on May 18th. Strijen is nearly sold out and Beek is filling up fast, so buy your tickets in advance if you'd like to come, in case it's full on the night! Hellevoetsluis is at the Ri-Jo dance centre… plenty of room there, but the other two are smaller venues. CD's will be for sale at GREAT concert bargain prices!! Kerani will play a 30-minute set from her new instrumental masterpiece, and Asher will sing songs old, new and newer! Further details & tickets here. 27/04/14 ~ New You Tubes!! These new You Tubes have been uploaded since February. Heal Your Heart ~ Heal your heart, I love you & The river is flowing. Album tracks ~Black sheep boy, Song of eternity, Only you & Hiawatha. 27/04/14 ~ Two new albums by Myristica! A very popular guest artist on this site, Myristica has released two wonderful new instrumental albums, the enchanting compilation album Butterflies and Lullabies, and the reflectively wistful Waiting for Yesterday. Samples, CD's and downloads available here. 02/02/14 ~ Heal Your Heart - (High Planes Music volume 2) now available!! 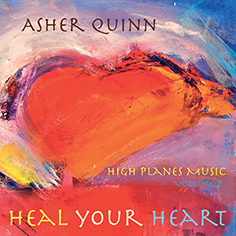 Asher's new studio album Heal Your Heart is now available on this site as a CD & download, featuring 16 entirely new interpretations of some of his best loved songs from recent years… moving, uplifting, spiritually deep and joyous. 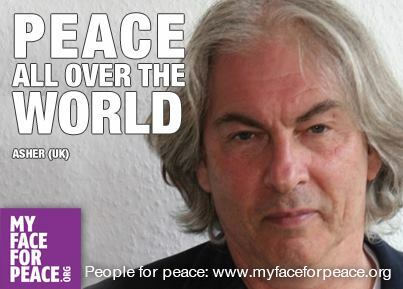 Asher will sing in Hellevoetsluis, Strijen & Beek, Netherlands in May, 2014. Further details and tickets here. Videos for 'One more hour' and 'Sometimes I feel like a motherless child' from Asher's new album Heal Your Heart have recently been uploaded. Also, a new comedy film in Asher's Ron & Mimi series, Ron & Mimi's Cosmic Love Soup, promotes 'Amazing grace' from the same album. I'm giving a small, festive concert in London at 8.00pm on friday December 6th, at Violet Hill Studios, a quiet healing centre in St. John's Wood. The lovely meditation room holds about 40 people, and makes for a most intimate atmosphere. I'll be singing a few of my versions of Christmas carols like 'Silent night' and 'In the bleak mid-winter', plus tracks from my new album State of Grace, and other songs of mine that people like! I'll be joined by my friend Mei-Ling Grey (aka Myristica) who will play three of her own delightful and wistful instrumental tracks, and Mei-Ling and I will also play and sing a couple of our collaborations. Healthy nibbles and drinks are included in the price of £20, and our CD's will be for sale at Christmas bargain prices!! Full details here. 26/10/13 ~ Special seasonal CD offer!! My new album State of Grace is currently available in my web-shop with This love, (a compilation of some of my early songs), for only £9.95 plus p&p... two albums for just £9.95!! This offer is open until December 20th, with seasonal gifts specifically in mind! See here. Bear in mind that... separate to this special one-off deal... I offer a 'buy two or three albums and receive a free gift CD of your choice', as well... ALL THE TIME!! This year-round deal works out at close to eBay prices! Recently uploaded videos are the epic 'Love will always heal your heart' and 'Greensleeves' Soon to come will be 'Morning sun', 'Evangelina', 'Rashani', Water lillies' and 'Days of honey' plus several 'live-in-concert ones' from my three October concerts in Holland. I've added a fourth musical project to the three that I'm currently working on... a Songs of Love and Chains volume three. This is where I re-interpret great songs by other artists. I'm planning on recording 'Scarborough fair', 'When he returns' & 'Don't think twice' by Bob Dylan, 'Tupelo honey' & 'The healing game' by Van Morrison, 'Natalia' & 'Le Facteur' by Georges Moustaki, 'When a man loves a woman' by Percy Sledge. 'Fields of gold' by Sting and several others! The other three projects I'm working on are a High Planes Music volume two where I am re-interpreting some of my own songs from 2004-2013, more acoustically; White Temple... an album for piano and violin, and Cosmic Midnight... a channeled communion with song, spoken word and instrumental vignettes. I'm hoping to complete all of these projects within the next 12 months. The albums Sacred Songs and State of Grace have now been added to the charming flipping page lyrics book on my site (see here), bringing it up to date! The book is in itself a work of art created by Emoke Labancz, who designs all my artwork, and I'm exploring whether we might actually be able to make it available soon, as a dedicated paperback book, at a good price available on my site. The words to all the songs I have ever written are in it, along with some beautifully poetic images, that make it a desirable item in its own right! If we are able to do this, affordably, I would sell each one personally signed. It has the spiritual presence of a meditative book of sacred poetry. Photos from my recent concerts have now been added to the gallery page here. 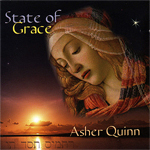 Asher's powerful and eagerly anticipated new studio album, State of Grace, is now available on this site as a CD & download, featuring 11 remarkable, beautiful and heavenly new compositions, and two bonus tracks. 27/05/13 ~ New album by guest artist Myristica, called Little Oak. Asher will be giving at least two concerts in Holland in October. Details to be announced in a while. 14/04/13 ~ Asher interviewed by Sadiq Alam for Mystic Saint. Asher Quinn's recently released CD, 'Sacred Songs' is truly a monumental work! It's his twenty-sixth album, and, believe me, every new album is even better than the last. Actually, it is inconceivable that this man has remained so relatively unknown all these years, as he has progressed from being, originally, the creator of beautiful, innovative instrumental new-age music (recording then as 'Asha') to a composer and performer today of great, mystical love-songs. Perhaps he is best described as a spiritual singer/songwriter, and the pioneer of a genre… the spiritual love song. 'Sacred Songs', says Asher, was channeled, literally, between March and July last year. Beautiful arrangements, excellent musician-ship and a disarmingly pure voice open the gates to the heart each time one hears the very first notes of the fourteen songs. And people who love poetry also have much to enjoy and marvel at, listening to his profound lyrics and metaphors (reminiscent of William Blake and the romantic poets) in gorgeous love-songs like 'Beyond Saturn' and 'I wish', and the spiritually themed ballads 'You are loved' and 'Evangelina'. There is so much spiritual wisdom here, as well as startling beauty. There is the folky, pagan 'Green man', and the heart-achingly beautiful 'Passion play', but particularly special is the final song One More Hour; (the Hallelujah Song). The original melody Canon in D (Pachelbel) later contains Asher's own lyrics and I can tell you, it's tender, passionate, heart-opening and enriching… incredibly moving. Characteristic of Asher Quinn's music is that the songs are so deep and diverse. If you listen to them frequently, every song actually seems to gather in strength, depth and intensity… as if they continue to grow and develop in your soul! A monument, indeed, with perhaps one small point of criticism: just over seventy minutes seems so very short with these kind of songs!! A double CD of this material would have been ideal!! Reviewer of Consciousness Magazine (Bewustzijn), The Netherlands. Earlier this month Asher conducted an interview with Ananda Trojan at the Rainbow Spirit Magazine in Germany, in anticipation of his concert at the Festival in Karlsruhe on May 20th. Ananda asks him about his spirituality and the message in his music. See here. 17 of my 18 catalogue albums are now available for download on this website here. The only album not currently available is Asher Quinn 'live' at Violet Hill. Myristica (aka Mei-Ling Grey) is now featured on this site here. Her 2 albums, Sea of Dreams and To the Moon and Stars, are available for download on her page, and the CD of To the Moon and Stars will follow shortly. Another guest artist Kerani (aka Erika Kele) will have her album 'The Journey' featured in the new year on a page here, and this, too, will be available for download and CD.